← Grade 9 Farewell – A Fantastic Celebration! 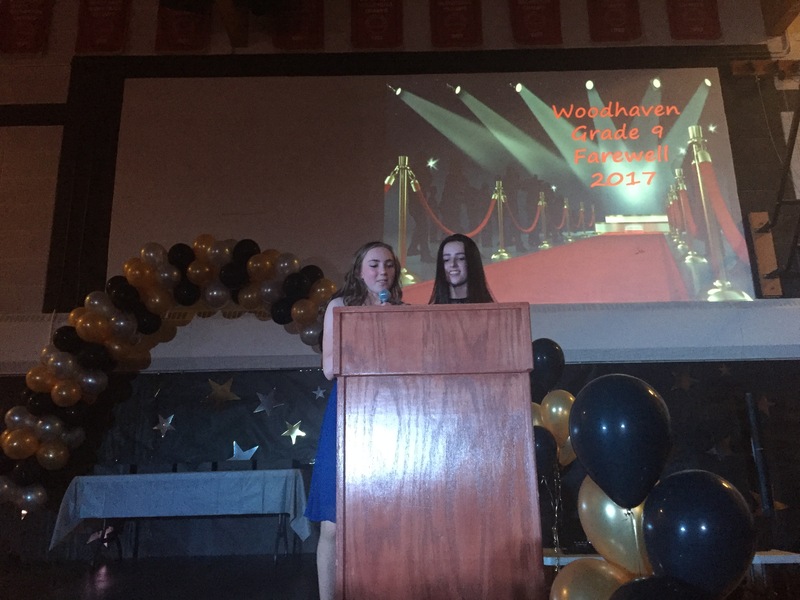 Recently we hosted our Grade 9 Farewell at Woodhaven Middle School. My previous blog shared my perspective as a proud staff member. What we are really proud of is the perspective of two of our students, Emma Wilton and Savannah Bay. Good evening family, classmates, and staff of Woodhaven Middle School. My name is Emma Wilton and I have been attending Woodhaven for the past five years with my friend Savannah Bay. We are both honoured to have been chosen to represent this year’s group of grade nines. From the beginning Woodhaven has been a welcoming environment that strives to make the transition into middle school smooth and exciting. Ever since grade four we have had chances to participate in activities such as Spring League Basketball and track meets. This allowed us to familiarize ourselves with the people we would spend the next five years of our lives with. However, I can still remember the first day I walked into Woodhaven. I was amazed by how large and confusing the hallways seemed. My first thought was how I would manage to avoid being stepped on by the “big kids”. Now I realize that Woodhaven is not the frightening maze I thought it to be. I have to say that I was most excited about the new responsibility of having a locker. We can all fondly look back on the time where we filled up the extra locker space with fancy chandeliers, rugs, and trinkets. This feeling of luxury didn’t last long as now it’s a struggle to even shove in my backpack and a binder or two. In grade five we were introduced to the variety of options available at Woodhaven. We were able to try things such as foods, art, music, drama, and industrial arts. French became more predominant in our studies and most of us looked forward to learning a second language. Grade six we fell into a regular routine of core classes and learnt bigger expectations. Academics became more important because of approaching P.A.T.’s but the things that stand out the most were the good times we had with our teachers and friends. We both recall the times in Mr. Bradshaw’s class where he would assist us in pulling off elaborate pranks on our classmates. An example of this is when we all worked to cover a student’s desk and chair completely with sticky notes. His reaction was priceless. In grade seven we had many fun collaborative projects such as building bridges and constructing thermoses. I remember carrying Emma across the soccer field wrapped in newspaper, duct tape, and string during one of Ms. Hunka’s science classes. The reason for this assignment has been forgotten, but it is something we both look back on and laugh about. In grade eight we were fortunate to be the first generation of students who worked on chromebooks as an alternative to paper. Woodhaven was keeping up with the rapid pace of technology in our world, it was exciting to learn with this in a classroom setting. Our class was filled with over sixty students which was something new and provided us with the ability to bond with a larger group of people. As a group we all looked forward to Fridays where we could ask Mr. Luck any question, it was interesting because he always seemed to come up with an answer. We took a trip to the Calgary Zoo to wrap up the unforgettable year. This year has been fast-paced and memorable for a variety of reasons. Together we were given many opportunities to flourish and reach our full potential as young individuals. This was demonstrated throughout many stages of our grade nine year. Our teachers have been preparing us from day one for the transfer from middle school into high school. They have given us time to go out into the real world and see what it’s really like. We all looked forward to missing a day of school to go with a professional and observe during a work day. We also went to NAIT and were able to see all of careers available there. These were two chances we were given to help us prosper later in life. This year we were privileged to participate in the bike-a-thon for The Down Syndrome Society. We were given the responsibility to support the cause by donating and keeping each bike in constant motion for six hours. Not only was this for a great cause but it gave us a fun day to spend with each other. The teachers of grade nine have gone above and beyond what is necessary to make a classroom environment enjoyable. One of my favourite memories includes Mr. Teliani taking Mr. Huedepohl’s students out of his classroom and hiding them behind the counters. It was hilarious to watch Mr. Teliani try and convince Mr. Huedepohl that his students had run away. This was only one of the many practical jokes our teachers have attempted to pull off on each other. Throughout my time at Woodhaven I have always been involved in athletics. I started playing basketball in grade four on a spring league team and with the support of my coaches I have played ever since. Woodhaven offers chances to show off and improve athletic abilities in many different areas. From rock climbing in gym class to trips to Marmot Basin there is truly something everyone can enjoy participating in. I will always remember and now appreciate the extra lines we ran on the Senior girls basketball team with Mr. Chan and all the wall sits we had to endure with Ms. Foster on the Volleyball team. Woodhaven basketball has given me time to grow as a player and develop leadership qualities on and off the court. Savannah and I have both been given the chance to coach younger Woodhaven athletes which is beneficial to both us coaches and the players. We are truly grateful to the teachers that volunteer their time and commitment to give us sports teams and other athletic opportunities such as the Vancouver Sun Run. The Sun Run allowed me to find my appreciation for running, grow friendships and left me with many memories that I will never forget. My athletic experience has been slightly different than Emma’s. Basketball was never my sport, but I played both volleyball and badminton which gave me skills and confidence during the seasons. I also remember trying out for our soccer team the first year it was established. The soccer coach was pregnant at the time and I recall her saying that if we couldn’t keep up with her we didn’t deserve to be on the team… I didn’t make the team. I’ve never seen a pregnant lady run like that before. Woodhaven is remarkable with recognizing student achievements. They give out athlete of the month awards, Pack Pride, and there is always a large award ceremony held at the end of each year. This is important for motivating students to do their best. Every year we have the Slam Dunk Competition and Talent Show that give students an opportunity to show off skills that we otherwise wouldn’t see at school. Students always seem to look forward to our annual Woodhaven events such as student-teacher hockey games and the Terry Fox Run. We are so glad that Woodhaven is an open environment for each and every one of us. Thanks to the staff at Woodhaven we all feel welcome and included. The familiar halls and faces will be missed, but we are ultimately looking forward to a new beginning. The grade nines would like to thank all the staff members who have helped us through these significant five years. As we look forward to high school we will never forget our time at Woodhaven. Thank you all. Inspiring thoughts from two wonderful students at Woodhaven Middle School. This entry was posted in Developing and Facilitating Leadership, Engage our Community, Engage Our Students, Fostering Effective Relationships, Leading a Learning Community and tagged Edmonton Down SyndromeSociety, Gr 9 Farewell, NAIT Career Fair, parkland school division, Talent Show, Vancouver Sun Run, Wolfpack Athletics, Woodhaven Connects, Woodhaven Middle School, woodhaven wolfpack. Bookmark the permalink.